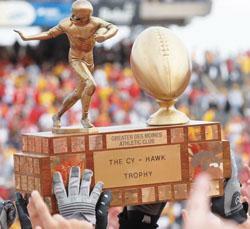 But that's what Iowa and Iowa State will play for when they meet up on September 10. The trophy's new design was revealed by the Iowa Corn Growers Association today, and it depicts "an Iowa family together after a day on the farm." A press release boasted that the trophy touts Iowans as "caring, trustworthy, committed, and compassionate, stewards, mentors and educators." That's all well and good. We're sure Iowans are all those things and more. But this is a football game. Board member 1: Leadership abilities, good interpersonal skills, experience in relevant fields, good business sense: all important. But they're all meaningless without what I really want reflected in our new CEO: what one needs to do to one's teeth after enjoying a delicious ear of Iowa corn. Board member 2: You know, I think I might have the right person for you. Board member 1: Who's that? Board member 2: This guy here, Craig Floss. *You all just dodged a bullet. We could have called the design corn-y. And sort of just did. But not in the post proper. You're welcome.